When Bronx student Justus Williams started third grade at P.S. 70, his mother, Latisha, urged him to take on chess. The hobby was "less common" than basketball, she said. But Justus wasn't enthusiastic at first. "I thought I was going to be embarrassed," he said. Justus found out recently that he will travel to Halkidiki, Greece in October to represent the U.S. in the 2010 World Youth Chess Championship. That's after a summer filled with tournaments such as the Pan American Youth Chess Festival in Brazil and the World Open in Philadelphia. 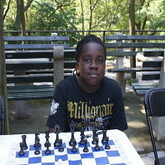 Justus first played at a Chess-in-the-Schools program in the Bronx's P.S. 70, when he was in the third grade. His instructor Shaun Smith said Justus had more focus than his peers, and pushed himself to the top of the class—and the country—by fourth grade. "He's a very mature sixth grader in that he's stoic and adult-like," Smith said. "He's the quietest person. He's very shy." As he started winning, the champ began to see chess as less of a chore. "My mom didn't have to push me to go to tournaments anymore," he said. His grades got better, too. Great story!! Students need access to various activities in order to spark their interest! It's a shame that many of the arts and extra curricular activities are slowly leaving the schools.